Electro House Underground features a huge palette of sounds and samples which reflect an acknowledgement of the development of the Electro House Scene over the last two years, and then moves things forward with more minimal textures, ambiences, twisted basses, lush pads, tech fx, heavy gated drums and percussion, and a huge selection of singe hits alongside the loops so you can build your tracks from the underground upwards. The Synths are tearing and will cut through the noise with unprecedented texture and ambience whilst the basses have just the right amount of bottom end to shake the speaker system of any club mainroom. Drums include huge beefy kicks, crisp percussion and cracking snares which when combined will fill the dancefloor in seconds. The FX samples will melt effortlessly into your music and there are plenty of filtered and toppy loops which merge together to make a unique and addictive backbeat to any breakdowns or for more minimal moments. 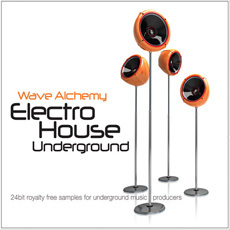 1.2GB of 24Bit 44.1KHZ Electro House Samples, including 492 Wav Samples, 492 Rex2 Loops, 255 Electro House Drumloops, 50 Filtered Percussion Loops, 95 Tech Bass Loops, 92 Electro Synth Parts, 50 Searing Fx samples, and 56 multisampled instruments.